The Second World War has no shortage of dramatic episodes. There are thousands of stories to be explored so that we might learn of the sacrifices, courage, hardship, and despair experienced by those who took up the supreme crusade. Few stories however can match the drama of the German battleship Bismarck’s short-lived career. In the Reference section below I have listed a few of the many books that will provide the full story. Suffice it to say that the Bismarck’s story contains all the elements of an unforgettable “war” story: a fierce and shocking engagement with England’s most famous warship- HMS Hood, a desperate sea chase, obsolete torpedo bombers crippling the state-of-the-art Bismarck, and a final savage ending surrounded by controversy. Aoshima’s 1/700 line of kits are nice enough out of the box. In the small scale of 1/700 however, many details understandably must be molded too thick and lack any richness. To make the kit come alive, a photo etched brass detail set is essential. I usually use Gold Medal Models sets but for this kit I decided to give Tom’s Modelworks brass a try. I used their 1/700 Bismarck/ Tirpitz set and was pleased with their quality. I have read of inaccuracies with the Bismarck kit but in this scale, I did not want to concern myself too much with questions of placement, set-up, or absolute correctness. 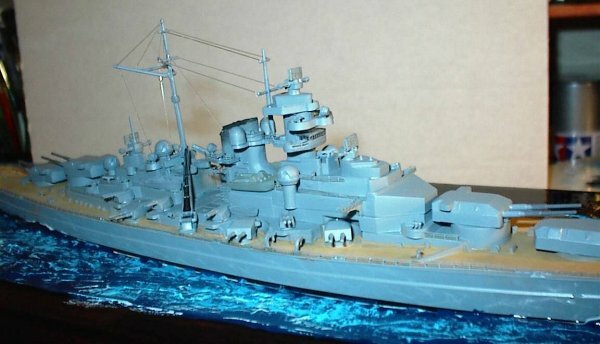 Also, with this subject, there is endless debate as to painting schemes, the most prevalent being the question of what color the tops of the main gun turrets were. Certain accounts mark the color as a mustard yellow type. Others state it was no different than the main grey color. My thinking is this: the Bismarck had a very short operational life with a select number of photographs existing. Also, there was not that many survivors and few of them left detailed accounts. Therefore, for this particular ship in 1/700 scale, I can live with some “inaccuracies” while striving to make a decent presentation of the Bismarck. When I tackle the 1/400 Heller Bismarck, I can be more attentive to detail! Overall, parts fit was very good. I believe this kit has been in production for quite a while so there was a bit of flash to clean up on some of the smaller parts, especially the secondary and anti-aircraft armament. The main hull and deck is one piece and is nicely done. I separate construction into various sub-assemblies, which is generally the way the instructions dictate. I also kept an eye on the photo etched brass instructions, which helpfully indicate which kit parts to replace. The main stack is much improved by adding 2 brass crane pieces, vents, and a stack grill. I used my trusty Dremel to drill out the solidly molded stack. Care must be taken here so you do not penetrate through the stack itself. I carefully cut the grill from the brass sheet with an Exacto blade on a piece of hardwood. Green Zap CA glue was used for attaching these brass details. This sub-assembly went together very well. I cut off the bridge wings, sanded the edges down, and replaced these wings with very nicely done brass pieces. A separate platform with railings completes each bridge wing (2 pieces per wing). The result looks much better than the solidly molded kit pieces. I also replaced the plastic kit radars with brass pieces. These must be carefully folded with a pointy tweezers and are attached to the directors. Another nice touch to add is the aircraft hangar doors. The kit simply has a flat edge. The brass doors provide a nice relief and are easily affixed with CA glue. There is also a large rear aircraft door to attach. Brass railings were cut to shape and attached to the completed superstructure. I replaced the plastic aircraft catapult with the finely detailed brass catapult provided with the Tom’s Modelworks set as well. I then assembled the 4 main gun turrets (unlike on US battleships that number the ship’s turrets, the Kreigsmarine named them from fore to aft, Anton (A), Bruno (B), Caesar (C), and Dora (D)) and set them aside. I also attached the secondary armament gun barrels to their respective turrets but decided to leave the turrets on their sprue for painting. Since the Bismarck’s operational life lasted less than a month and because the German High Command tried very hard to keep the existence and launching of the ship a secret, there were only a limited number of black and white photos taken of the ship. Many of you may be familiar with the black & white camo stripe pattern that the Bismarck is usually portrayed with on model kit box art and other paintings. However, it is known that just before the ship sailed on her fatal mission, these black/ white stripes were painted over to match the overall grey of the ship. The Bismarck also was painted a darker grey on the fore and aft portions of the hull. There was also a cleverly placed fake bow and stern wave painted onto the ship. This pattern was an attempt to confuse an enemy observer at long ranges into believing the ship was moving at a different rate of speed than she actually was. One must remember that the Bismarck’s main reason for being was to prey on enemy merchant shipping without having to flee at the first sign of British warships. The intricacies and development of naval ship camouflage are endless—see the Reference section for an excellent website with information on the history of this topic. The basic colors as far as my knowledge goes needed to paint the Bismarck at the time of her fatal mission are a dark grey (for the forward and rear hull areas and for the main gun barrels), Camouflage Grey (for the fake bow and stern waves), a teak or wood color for the decks which will be accented with pastel chalks, black (for funnel cap), and a basic grey for the majority of the hull, upperworks, etc. I wanted to try the Tamiya Acrylic Spray color Haze Grey after sampling it on a piece of cardboard. This color will be wonderful on modern US warships as well but it seemed to give me a good basic color for Bismarck. After all the sub-assemblies were glued in place and all railings were installed, I sprayed the entire ship with the Tamiya Spray Haze Grey (TS-32 in Tamiya’s lexicon.) Make sure you keep your distance here—you don’t want the paint to gob up on the fine brass parts especially the railings. Some sections may fill anyway but a sharp Exacto blade will clear it up. After drying, I then used Testors Gunship Grey for the bow and stern sections and Testors Camouflage Grey for the bow and stern waves. The most tedious and time-consuming portion of the painting process is the teakwood deck. There is no easy way around this—it takes patience and loads of touching up. I used Testors Wood and mixed in a little bit of flat yellow. I thinned the mixture using Testors thinner and started in using a variety of brushes. Mistakes will be inevitable especially around the deck fixtures, which should remain the initial grey color. When the decks were completed and touched-up, I used a mixture of light, earthy colored pastel chalks to lighten and provide some texture to the decks. I used a heavy black wash mixture to fill in the hollowed out funnel and then painted the top of the stack and grill flat black. Anchor chains were painted a darker grey and then the fore section was roughed up with pastel chalk to simulate wear and tear. I used clear sprue for some simple rigging and I tried to stretch it as thin as possible. I am not sure I succeeded because in this scale, rigging should be nearly invisible to be realistic. After this was completed, it was time to place the ship in her element. I used a pine signboard from the craft store, Liquitex acrylic gel medium and a mixture of blue, green and white colors to create the water scene (see my article on Modeling Ships Underway in the Features Section for details. In terms of ease of construction, the Aoshima Bismarck is a good kit. The Tom’s Modelworks photo etched brass set adds a wealth of detail to the kit. I am happy with the results and can recommend the kit to any ship modeler. I cannot compare it to the other plastic 1/700 kit made by Matchbox as I have yet to come across that kit. The Bismarck Chase: New Light On A Famous Engagement, by Robert J. Winklareth, Naval Institute Press, 1998, ISBN 1-55750-183-1. Jane’s Battleships of the 20th Century, by Bernard Ireland, HarperCollins, 1996. ISBN 000470-997-7. Pursuit! By Ludovic Kennedy. Kennedy was a British seaman on a destroyer accompanying the British battleships chasing the Bismarck. This is a fantastic overview of the saga. Battleship Bismarck by Baron von-Mullenheim Rechberg. This gentleman was one of the few survivors and was a gunnery officer on Bismarck. An incredible account. I believe the Naval Institute Press still carries this title in print.